I've come across a few cute Christmas items while surfing around the Internet. I thought I'd pass them along to you today in case you're thinking of adding to your decorations this year. 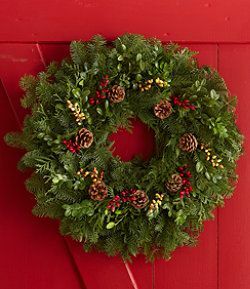 A pretty door wreath from L L Bean. H and M has tons of cute holiday pillows and cushion covers for under $10.00. This one is just $5.99. See the others here. I ordered this one with tassels, but they are sold out of it now. :-( I only tell you that to say even though the prices are low on these holiday pillows, the quality is good. This holiday mug set from Target will look great with any color combination, and you know your guests will enjoy their coffee more from these pretty cups. If you still need ornaments of the smaller size, here is a great set from Pier One. 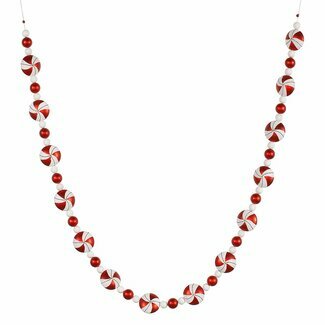 I know this one looks like a necklace, but it's actually garland from Wayfair. You have to use your imagination for the next one. I know at first glance it doesn't say "Christmas", but if you have a farm house motif or a rustic style, this would be perfect. It's only $7.99! (Also from H and M.) Several of them together would be perfect filled with ornaments, Christmas greenery, or even Christmas cards. It measures 4 3/4" x 4 3/4".